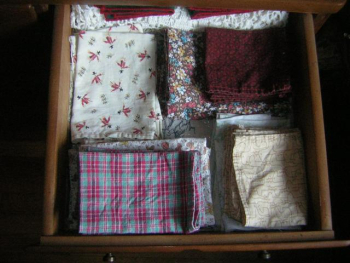 When I was young in the mountains, I sewed cloth napkins on my 1946 Singer sewing machine. I made red plaid ones for Italian meals and fun butterflies for Summer feasts. I carefully packed them away. . .
Now that I am married and we have our own home, the napkins are being well used and I've added quite a few more to the collection. Three years in, do cloth napkins have a practical use in the home? You bet! We love using cloth napkins and our guests feel extra special when they stay for meals. They're a simple, frugal solution to multi-napkin meals (like ribs and fried chicken) and at-the-table spills. We're not tired of folding them and when we ate meals away from home, I packed them in lunches. They're also a great way to entertain babies honing their fine motor skills.